Faith isn’t something you ever simply achieve. It’s not something that you ever nail down as a fait accompli. Faith works this way: Some days you walk on water and other days you sink like a stone. Faith invariably gives way to doubt before it again recovers its confidence, then it loses it again. 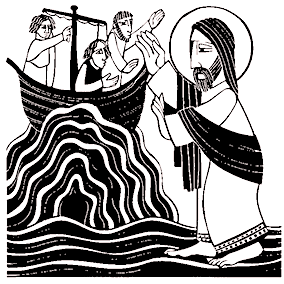 We see this graphically illustrated in the famous story in the gospels of Peter walking on water. The story goes this way: The disciples had just witnessed a major miracle, Jesus feeding more than 5000 people with five loaves of bread and two fishes. Having just witnessed a miracle, their faith was strong. Soon afterwards they get into a boat to cross a lake. Jesus is not with them. A few miles out they run into a fierce storm and begin to panic. Jesus comes walking towards them on the water. Initially they’re frightened and take him for a ghost. But he calms their fear by telling them, right from the center of the storm, that he is not just Jesus but that he is God’s very presence. Peter is immediately buoyed up in his faith and asks Jesus to let him too walk on the water. Jesus invites him to do so and Peter gets out of the boat confidently and begins to walk on the water. But then, realizing what he was doing and the incredulous nature of it, he immediately starts to sink, cries out for help, and Jesus has to reach out and rescue him from drowning. What we see illustrated here are two things that lie at the heart of our experience of faith, namely, that faith (literally) has its ups and downs and that it works best when we don’t confuse it with our own powers. Faith works best when we don’t confuse it with our own efforts. Faith has its ups and downs: We see this, almost pictorially illustrated, in the incident of Peter walking on the water. Initially his faith feels strong and he confidently steps onto the sea and begins to walk. But, almost immediately upon realizing what he was doing, he starts to sink. Our own faith works exactly like that, at times it lets us walk on water and at other times we sink like a stone. The gospel-image of Peter walking on the sea speaks for itself. After this He [Jesus] showed a most excellent spiritual pleasure in my soul: I was completely filled with everlasting certainty, powerfully sustained without any painful fear. This feeling was so joyful and so spiritual that I was wholly in peace and in repose and there was nothing on earth that would have grieved me. This lasted only a while, and I was changed and left to myself in such sadness and weariness of my life, and annoyance with myself that scarcely was I able to have patience to live. … And immediately after this, our Blessed Lord gave me again the comfort and the rest in my soul, in delight and in security so blissful and so powerful that no fear, no sorrow, no bodily pain that could be suffered would have distressed me. And then pain showed again to my feeling, and then the joy and delight, and now the one, and now the other, various times (Showings 15). Julian of Norwich was a renowned mystic with an exceptional faith and, yet, like Peter, she too vacillated between walking on water and sinking like a stone. Her confident feelings came—but they also left. As well, faith works best when we don’t confuse it with our own efforts. For example, Donald Nichol, in his book, Holiness, shares a story of a British missionary working in Africa. At one point, early on in his stay there, the missionary was called upon to mediate a dispute between two tribes. He had no preparation for this, was naïve, and totally out of his depth. But he gave himself over to the task in faith and, surprisingly, reconciled the two tribes. Afterwards, buoyed by this success, he began to fancy himself as mediator and began to present himself as an arbiter of disputes. But now, however, his efforts were invariably unhelpful. Here’s the irony: when he didn’t know what he was doing, but trusted solely in God, he was able to walk on water; as soon as he began to wrap himself in the process, he sank like a stone. Faith works like that: We can walk on water only as long as we don’t think that we are doing it with our own strength.